Concord Publications, ISBN 962-361-601-5. Price: $20.95 USD. I wish I had a dollar for every time someone has posted the following comments on the ML DGs: “When will Concord publish a book showcasing Ron Volstad’s uniform plates/ box illustrations”? I heartily agree with those sentiments, so this review may be somewhat biased. Those who may be offended by my lack of an objective point of view need go no further. The rest of you: sit down and read on. This book is the premier edition of a new series called “Fighting Men”, which Concord had announced several years ago. It is the result of over a decade work that Mr. Volstad has managed to turn out, in-between other work for Concord and Dragon Models Limited. The first image is dated 1993; the last is dated 2004. The book contains 20 color plates and two sets of annotated line drawings, all by Mr. Volstad. The plates depict Heeres (Army) troops as seen in action during the campaigns in Poland, Norway, Denmark, Belgium, France, Crete, Libya and the Soviet Union. Men of various units are depicted, including: infantry, armor, pioneer, artillery, anti-tank, cavalry and mountain. The climate zones depicted range from the fjords of Norway, to the mountains of Crete, the deserts of Libya, the frozen steppes of the Soviet Union and the temperate zones of Western Europe. What this means is that an extraordinary range of uniforms, weapons and equipment is depicted, with just about any item commonly worn during the times in question presented in great detail. The last two drawings, at the book’s end, depict various bits of equipment as un-colored line drawings. This format allows for certain details to be clearly seen in their entirety, which will be of great assistance to figure modelers. Each is accompanied by annotated descriptive text. Each of the 20 full-color plates is accompanied by a facing page with text by Gordon Rottman. Each page explains the nomenclature of the items being worn by the figures as well as the context in which they are being worn. Historic notes on the units that are depicted are given, as well as technical information, where applicable. Several plates feature crew-served ordnance such as 3.7cm PaK, 7.5cm l.IG and 15cm s.FH. Several AFVs are depicted including Pz.Kpfw. I, II, III, IV and 35(t), as well as a StuG. III Ausf. A and a Pz.Jgr. I Ausf. B. As usual with Mr. Rottman, it is in the area of AFVs where the text falls apart. - Page 6: the number of tanks listed by the writer as belonging to 4. Panzer Division, during the time in question are: 33 Pz.Kpfw. II, five Pz.Kpfw. III and six Pz.Kpfw. IV in each of four battalions, for a total of 176 tanks. “Panzertruppen Vol. 1” by Tom Jentz lists a total for the division of 342 tanks, including 184 Pz.Kpfw. I, 130 Pz.Kpfw. II, no Pz.Kpfw. III, 12 Pz.Kpfw. IV and 16 Bef.Pz. Quite a discrepancy not only in numbers, but in types. 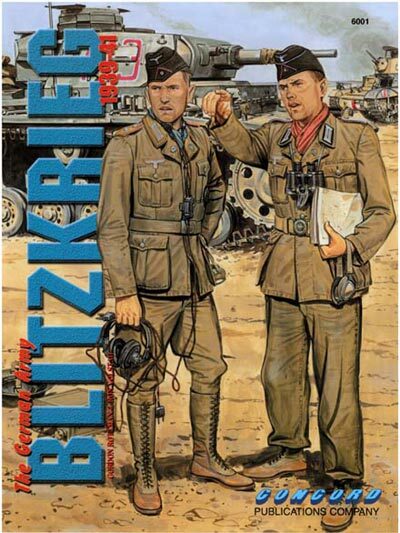 The author also states that the Balkenkreuz national marking was changed after the Polish campaign to “white-edged black”, when actually they were white outline only. - On page 8, the Czech tanks are inaccurately described. For instance the writer says that both the Pz.Kpfw. 35(t) and 38(t) were Skoda products. This is untrue, only the 35(t) was; the 38(t) was built by Praga (although it mounted a Skoda A-7 main gun). The writer also states that the 35(t) was armed with a “3.72cm gun plus 15mm and 7.92mm co-axial machine guns”. The tank never had a 15mm machine gun, the main gun was a 3.7cm piece, and the “co-axial” 7.92mm was not strictly such. It could also be operated independently of the main gun, according to Francev and Kliment’s MBI book, “Skoda LT vz.35”. - On page 10, the writer incorrectly states that the Pz.Kpfw. I was armed with twin MG34s. It was in fact armed with a pair of MG13k, according to Jentz and Doyle’s Panzertracts Volume 1-1 “Panzerkampfwagen I”. - On page 16, the StuG. III Ausf. A is described as being armed with a piece “based on a 7.5cm KwK L/24 howitzer”. It is not a howitzer, but a gun (or “Kanone”, which is what the second “K” in “KwK” stands for, when it was tank mounted), and is actually designated 7.5cm Kan L/24, according to Jentz and Doyle’s Panzertracts Volume 8, “Sturmgeschuetz”. There are some lesser mistakes and the usual typographic errors, but nothing to really get “your knickers in a knot” over. In the end however, it is the magnificent color plates that will be the main attraction in this book. Figure painters and admirers of Mr. Volstad’s work should get this book now. Concord books have a habit of going out of print rather fast.